Please note: I am not affiliated with the makers of GarageKey, and everything I know about it is on this page. Windows XP driver but couldn't find it. If I receive more emails asking for help, I'll remove this page. 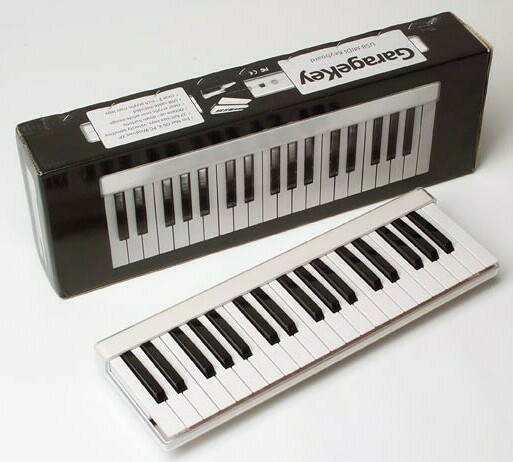 When I first saw Carl Lumma's review of the DVForge GarageKey MIDI keyboard in Keyboard Magazine , I was impressed its clean design, small size and USB connectivity (goodbye, MIDI interface!) — but dismayed that XP support was lacking. However, there were some situations where I could use it with an OS X Mac, so I got one anyway. I was surprised to find that its manual mentioned Windows compatibility! I spent a lot of time trying to find out whether there was some way to get it to work with Windows as advertised. After a protracted search, it appeared that there was in fact no Windows support. I stopped looking. 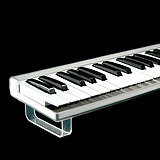 The width of the keys is full-size (same as a grand piano, that is), but the depth (front to back) is not. Unfortunately, most ASCII keyboards are too wide for this. 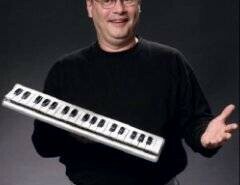 So far, the only full-size keyboards I've found that fit are the narrow Apple models like the one shown above. The keys are not weighted (and feel kind of spongy to me; YMMV). 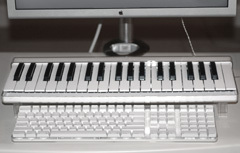 The only controls are octave up/down buttons (see below). The only interface is USB (no MIDI ports). There are no status indicators (like MIDI Active, which would be useful). The end keys are not protected and might get hurt if you dropped the keyboard. It's very photogenic (if you want to take pictures hands playing a keyboard, you can't get cleaner than this). That said, I'm pretty happy with mine (in fact, enough that I got a second one, so I have one in both my at-home office and my at-work office).